Star & I are not feeling too well. Mom says our poo isn't right, & we're not eating & just kinda tired. She hauled me to the v-e-t. (I had to go for shots anyway). We think we should consult with woo about this, after all, who knows more about sibes than another sibe? Since they have already been to the vet, I decided to just let their vet handle the physical aspect of their ailments and I would handle the psychological aspects. As some of you know, Star's boyfriend and Jack's best friend, Moon, moved away to Pennsylvania and now can't come over to Star and Jack's house to play. In my Siberian opinion, their symptoms tell me that they are depressed and missing Moon lots and lots. So to help Star and Jack feel better, I recommend that their humans give them even more love and attention than they already do give them. 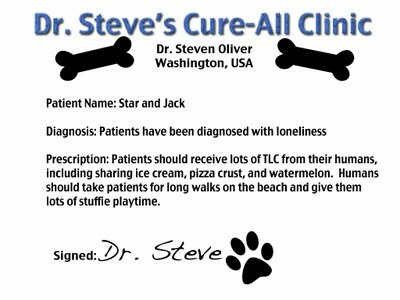 I recommend that the humans share their snacks (I included examples of some of my current favorites), take them for lots of walks, and let them play with stuffies more (especially Jack-a-roo). Star and Jack, I sure hope you start to feel better soon. It's no fun being lonely, but it is sweet that you loved Moon so much.